Stayed There are 3 couples and a baby in our group. We booked this villa. It is beautiful. our very own beach. great for peace and quiet. also great for families and big groups. There are only 5 villas here, so Judith( manager) and Jane(housekeeper) and staff are just a phonecall away. Take note though this resort is 15min away from Maenam and about a half hour drive away from Chaweng. but if you want relaxation, peace of mind, and away from noise... this is the place 2 stay. thanks to all who made our holiday enjoyable. Tropical and contemporary in style this stunning villa has 260 sqm of living space. 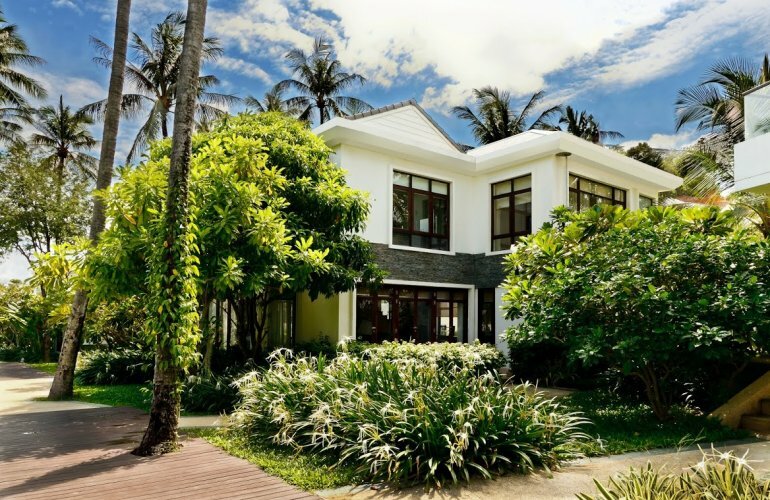 One of just five luxuriously appointed villas set amidst tropical landscaped gardens and feature ponds beside the golden sandy beach at Bang Por, on the islands northern coast. Enter and be welcomed by the light and airy feeling of this double storey three bedroom villa. All the bedrooms have en-suite bathrooms with a balcony adjoining the master bedroom for a sensational view of the Gulf of Siam. Designed to maximize living space, this villa has an extra spacious living/dining area, a fully equipped European kitchen and a terrace with a private salt purified free form villa pool. Its stylish layout depicts the villa's individual character and charm and makes it unmistakably alluring - definitely the ideal place to relax and indulge in some of the best life can offer. The villa is fully equipped with flat screen TVs, satellite channels, DVD, complimentary wireless broadband, electronic safe, I-pod docking stations and a local mobile phone. A blend of natural materials and soft colours for furnishings and decor, as well as high end technology guarantee an ultimate experience of luxury and comfort. In addition to the villa's own private pool a shared 30 meter beachfront pool with ample deck space is accessible to all guests and set amongst communal gardens. This magnificent setting boasts spectacular views of Koh Phangan and the waters beyond.